Update: Did I seriously forget Dr. Boom? Let's fix that right now! Hearthstone is about to get a major shakeup next week with the deployment of the game's next patch. The Patron Warrior deck stands to nerfed severely with the upcoming adjustment to Warsong Commander, which makes that particular minion all but useless. Blizzard does not take nerfs lightly, but when they act, they normally act severely. Hearthstone players have not forgotten the paradigm-shifting changes like the ones issued to Leeroy Jenkins and Starving Buzzard. Having said that, players should not expect another change of this magnitude for a good while. That's not to say a change won't eventually happen. So for the sake of purely analyzing hypotheticals, Shacknews is taking today to look through a handful of hypothetical cards that are currently frontrunners for Hearthstone's next big nerf. What card will have its reign of terror quelled next? Let's start with the most obvious one. Since the arrival of the Grand Tournament expansion, Secret Paladin has skyrocketed in popularity and has proven immensely effective. The resurgence is credited solely to Mysterious Challenger, who is formidable in himself with 6/6 stats for 6 mana. However, his Battlecry plays all Paladin Secrets in a player's deck. Paladins have some killer secrets that hurt heavily when played individually, but they're often unbeatable when played all at the same time. Noble Sacrifice means you lose one offensive attack, Redemption means any opposing minion killed comes right back (woe to you if that minion has a Deathrattle effect), and Avenge powers up another minion after a target is killed... a target that is then immediately resurrected with Redemption. You get the point. This is a demoralizing play and has already been terrorizing Hearthstone players since TGT's release. 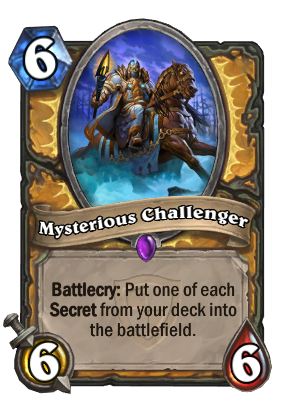 However, what some Paladin opponents may not want to hear is that Mysterious Challenger is entirely beatable. Paladin players can just as easily fall prey to RNG-sus and end up with their Secrets in their hand and pro players like Trump have already started finding counters to this deck. Still, Mysterious Challenger has hit the ground running and if he maintains this winning pace, he may eventually land on Blizzard's radar in the future. Hunters already have the tools to end a game quickly, but one of the class's biggest weaknesses is arguably its lack of card draw spells. Lock and Load rewards spell users with new Hunter cards, all of which are helpful in their own way. There are few Hunter-specific cards that are really duds. So Lock and Load arming Hunters with new ways to kill you is already brutal on its own, but the fact that it's designed to be used in synergy with Hunter spells is really the killer, since Hunter spells are already low-cost and inflict maximum pain. Getting new Hunter cards for using Hunter's Mark, Arcane Shot, the amazingly-useful Flare, or any number of the Hunter's Secrets is just icing on the cake. With so many low-cost spells available, Lock and Load feels slightly overpowered at only 2 mana. 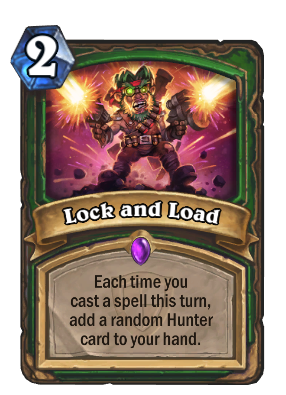 That means Hunters can potentially reload at turn 3 or 4 with a handful of new cards. Look at it this way: Starving Buzzard's nerf was based on the idea that Blizzard wanted players using it as a late-game card draw strategy. Why wouldn't that principle apply here, as well? Lock and Load would be just as effective a way to draw cards late in the game, especially if used in conjunction with something like Quick Shot. A nerf may risk breaking this card in the way it broke Starving Buzzard, but the discussion is at least worth having. Here's a card that's been around since the beginning of Hearthstone, but has gradually been abused more and more by Druid players. Controlling the board has never been more important, because if there's one or two minions already on the board, the Druid will simply whip out Force of Nature and this surefire game ender. He can even use Innvervate to expedite the process. The 3-cost Savage Roar has only grown more useful when used in combination with newer spells like Living Roots and Dark Wispers and it's reached a point where anyone playing against a Druid knows what to expect and what to try and prevent. The case for nerfing Savage Roar is that it's used in the same fashion that Shaman uses Bloodlust, which is a 5-mana spell. 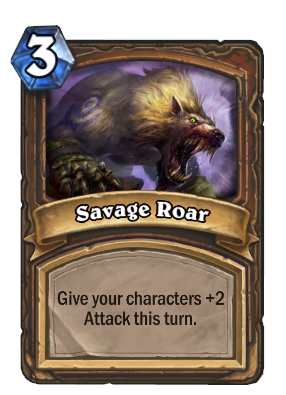 Increasing Savage Roar's cost from 3 to 5 sounds a little bit more fair. It would all but kill the Force of Nature combo, but considering that this combo is good for 14 damage (don't forget the Druid himself also gets a 2-attack boost), it's something worth possibly discussing. The counter-argument, of course, is that opponents simply need to better adapt to this strategy. This is why Taunt minions are so crucial to the game, so maybe those bumping into Savage Roar should go back to the drawing board. Savage Roar is a major annoyance, but a nerf sounds extreme. Let's end on a card that this writer is shocked hasn't already been nerfed. How do Hearthstone players live in a world where Patron Warrior has been targeted, but Oil Rogue is allowed to slink away scot-free? The Goblins vs. Gnomes expansion has given Rogues a myriad of new ways to power up their weapons. There's always been Deadly Poison, which is already a nuisance, but the 1-cost of that spell makes it exceptionally easy to pair it with Tinker's Sharpsword Oil, which ups the attack power of the weapon by another 3. Let's do the math. Hero Power added to a pair of 1-cost Deadly Poisons and added to Tinker's Sharp Sword Oil creates an 8-attack weapon. That hurts when the Rogue introduces that to your face. Now add Blade Flurry, which inflicts the weapon's damage on every friendly character. That means the Rogue basically just cleared the board and inflicted 16 damage on your hero's face for just 8-mana. Think that's infuriating? For just one more mana, throw in a Southsea Deckhand for an extra 5 damage, thanks to the Tinker's Sharp Sword Oil effect, for a whopping 23 face damage and a total board wipe. Fortunately, the solution to this is very simple and it doesn't involve touching Tinker's Sharpsword Oil at all. If a Rogue player can use that card to its fullest potential, more power to them! 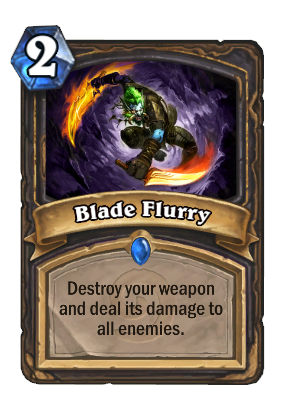 But just about any Hearthstone player should be able to admit that the card (as well as the other weapon-boosting cards) has pretty much broken Blade Flurry and made it obscenely powerful. So why not change the language of Blade Flurry just slightly? Make it so that it destroys a Rogue's weapon and only damages minions? That way, it doesn't do double face damage in a single turn. Basically, turn it into a 2-cost Shadowflame. That's a fair compromise, Oil Rogues, since it doesn't take any of the teeth out of Tinker's Sharpsword Oil and still allows for a viable board control strategy. Boy, talk about an oversight! How the bad Doctor escaped this writer's sights is a mystery. But there's a reason this guy is derisively referred to as "Dr. Balanced" and that's because Dr. Boom has become excessively powerful. Anyone lucky enough to unpack him has immediately made him a staple of just about every deck. What makes Dr. Boom so broken? Well, he's the same cost as War Golem and has the exact same stats, but he's got a pair of Boom Bots that cause major damage more often than not. It's a total of 9/9 stats for just 7 mana, which shoots over the normal curve. There are multiple targets to deal with, but few options to actually neutralize all of them. He's sickeningly versatile; a viable fit in just about any deck with few counters. "I'm not saying he isn't strong. He's a good card, but good cards can exist. That's okay. A card doesn't get nerfed just because it's good. A card gets nerfed because it's warping or ruining the entire meta, and Dr. Boom probably isn't doing that. The meta is very wide open and varied right now, with lots and lots of viable decks and deck types, many of which don't have a place for Dr. Boom." That's certainly fair. And what makes Dr. Boom something of a unique case is that one does't typically see a lot of game-breaking synergy with him. He's not like Savage Roar/Force of Nature or Tinker's Sharpsword Oil/Blade Flurry. Dr. Boom stands on his own, so it's difficult to justify a nerf from that sense. Still, a slight cost increase, similar to what Sylvanas Windrunner once received will hardly break this card and will still make him just as dangerous as he's ever been. As things stand, don't look for these cards to get adjusted anytime soon. Like I said at the start, this is just throwing out hypotheticals. But what's not hypothetical is that Warsong Commander is being nerfed and he will be defanged starting next week. So enjoy him this weekend and take the Patron Warrior for one last ride in his current form. Besides Mysterious Challenger these cards appear to be picked at random. Blade fury is the only decent aoe spell rogues have. And rogues are so rare on ladder. Fantastic arena class though, just because arena seems to reward tempo plays the most and cards like backstab and deadly poison make it really easy to clear a minion and then play a minion in one turn. It also has to do with Paladin being the 2nd strongest arena class and rogue's hero power trades 2 for 1 against Paladin hero power. That's how blizz does it too. Heyooo. Lock and Load and Blade Fury are not going to be nerfed for the time being because they are not being abused on the ladder. Rouge is one of the weaker classes right now because not many of the new cards have been adapted into competitive decks. Nerfs come when they are being played by everyone and it is effecting the overall experience. Patron was being played by everyone and it was super powerful. Miracle Rouge was being played by everyone and it was super powerful. Buzzard + Unleash hunter was being run by everyone and it was super powerful. Mysterious Challenger will be the next unless the hearthstone community is able to find counters to the deck which make it less competitive/overpowered. No one even uses Lock and Load. Mysterious Challenger is unlikely to get nerfed because it's not a one turn combo and doesn't fall into the category of "non interactive" They didn't nerf other cards that are over powered like Dr. Boom, I don't see why they would nerf Mysterious challenger. So are you guys picking popular games and assigning writers to write rather specific pieces on them, or are you picking popular games that your writers play and doing pieces on those? I realize that sounds like a stupid question now that I read it. But I've seen both. I'm drunk. I'm going to go play Shadow of Mordor. It's quite a fine game for a drunk. I honestly can't believe I forgot about Dr. Boom. He's been added. None of these cards need to be nerfed, Ozzie. The best way to nerf savage roar is to make it cost 0 +1 for each friendly minion on the board. This list is silly. None of these cards are broken. 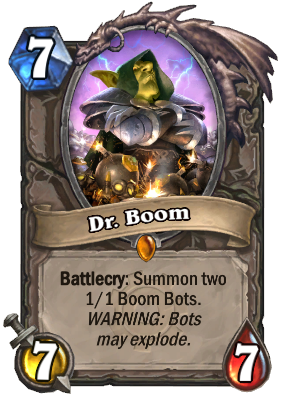 They'll nerf Dr. Boom to 6/7. Nailed it. I have no clue why Lock and Load is on the list when no one even plays it. I guess that would make it so no one would even consider playing it. Half of the reasonings for these nerfs make it seem like you don't even play (or watch) the game. Changing Dr. Boom to 6 attack actually makes it way better since it takes it out of BGH range, one of the most common counters to the card. Some of these cards are frustrating to play against but they won't get nerfed. Blizzard only nerfs cards that break the meta so bad that they are forced to fix it. Clearly there are balance issues with the game and some cards are overpowered but blizzard doesn't want to micromanage the game at this point to keep it completely balanced. Beyond "break the meta" it's also when certain cards tie their hands for future sets. One of the things they mentioned about the Warsong Commander nerf is Dreadsteed (1/1, Deathrattle : Spawn a Dreadsteed) was originally intended to be a neutral card but it was too powerful with Warsong.